Shields & Company, Inc. (“Shields & Co.”), a leading middle-market investment bank, is pleased to announce the sale of Heatbath Corporation (“Heatbath” or the “Company”), one of the nation’s leading manufacturers of heat treating and metal finishing chemicals. Heatbath retained Shields & Co. to assist in the evaluation of its strategic alternatives. This process resulted in a sale of the third generation, family-owned business to DuBois Chemicals, a specialty chemical manufacturer based in Sharonville, Ohio. DuBois Chemicals is a portfolio company of Aurora Capital Group, a private equity firm based in Los Angeles, California. Shields & Co. structured a transaction that satisfied the Heatbath shareholders’ objectives, while also giving creating several synergies that will allow DuBois Chemicals to continue its strong growth trajectory. The transaction was led by Tim White, Chris Nicholas, and Tim Haladyna at Shields & Co.
Heatbath Corporation is a specialty chemical manufacturer that specializes in chemicals for heat treating and metal finishing applications. Heatbath is a third generation, family-owned business that was founded by the shareholders’ grandfather in 1923. The Company offers an extensive product portfolio of over 700 SKUs to a diverse set of end markets, including automotive, aerospace, defense, and firearms. Heatbath has long been the nation’s leading supplier of heat treat salts and quenchants that are used to braze, carburize, clean, descale, or harden both ferrous and non-ferrous metals. In addition, Heatbath offers a number of metal finishing chemicals that range from cleaning and coating processes for initial fabrication to the application of the final functional, protective or decorative coating on finished metal parts. Heatbath is headquartered in Indian Orchard, Massachusetts, with additional manufacturing facilities in Chicago, Illinois, and Detroit, Michigan. Shields & Company, Inc., founded in 1991, is a preeminent middle-market investment bank dedicated to providing middle-market corporate finance services in the areas of mergers and acquisitions; corporate restructurings and recapitalizations; debt and equity capital raisings; financial advisory assignments; business valuations; and fairness opinions. For more information please visit our website at www.shieldsco.com, or contact us at (781) 890-7033. 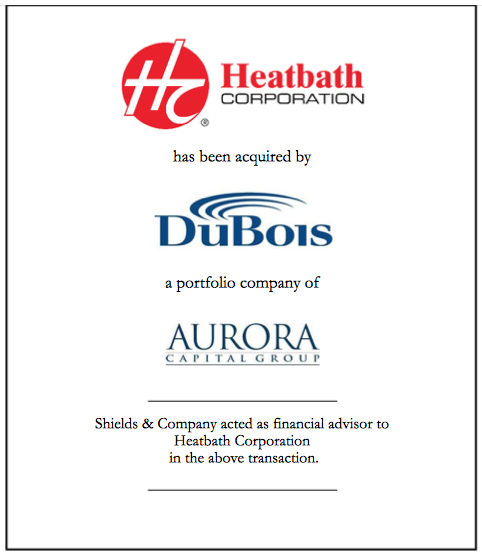 Shields & Company acted as a financial advisor to Heatbath Corporation in the above transaction.